Salary Packaging was introduced to administer the Fringe Benefits that employers provided to their employees. Employment perks, like company cars, are a benefit for employees and the Australian Tax Office introduced Fringe Benefits Tax to value and tax those benefits. Employees can sacrifice cash salary in lieu of employment benefits or perks to save tax. Certain employers, like charities or public hospitals, have an exemption for some benefits provided to employees. For employers, the system is capable of working with all tax entity types, varying payroll frequencies and pourpoints. Reporting is automated in the format of choice and delivered in line system triggers. Benefit items are defined on system, with requirements pre-set and employers select which benefits they wish to utilise and the default packaging fee that applies to each salary packaging benefit item. 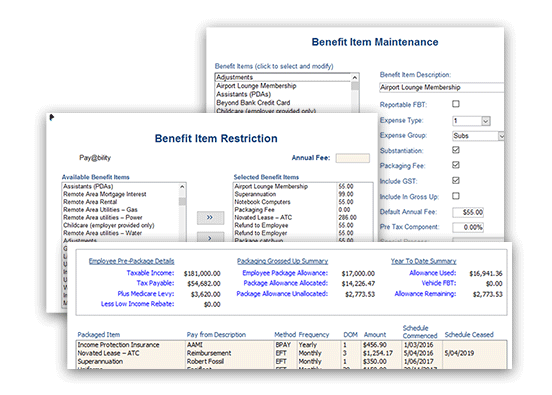 Where the substantiation is required, the system prompts for proof of the benefit to be supplied. Where there is a Cap that is being used, the Cap usage is tracked as the spend is updated, ensuring that the Cap is not breached and an FBT liability incurred. Unallocated usage determines how much of the Cap is available for future spend. Integration has been developed for Benefit cards and Meal Entertainment cards, allowing administrators to run exception reports for compliance. For Not-for-Profit employers, the systems can collect, record and remit FBT back for payment to the ATO. Reprint and rollback/re-run facilities have been created to restore payment files if they are corrupted or to export trace data. Payments are scheduled and generated for release as they fall due and automatically set for payment if there is sufficient funds and if there are sufficient substantiation for the transaction. Authorisation is required where these parameters are revised. 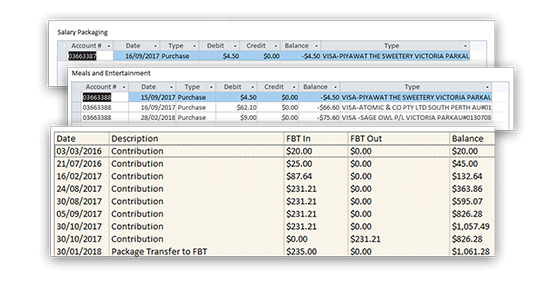 Tracking employer bank balances is on demand and transaction extracts allow for the accounts to be reconciled to the physical banking accounts.